What links a digital hacker who designs projects in a lab, a member of a CSA (Community Supported Agriculture) who believes in sustainable local produce and supports a farmer, and citizens who share experience and knowledge online? Perhaps it is the desire to redefine the relationship between production and consumption, the need to be an empowered citizen rather than passive consumer. To create, grow, reconfigure and question – to ‘hack’ society and transform it. Short Circuit / Short Process is the first edition of PiNG’s Summer Lab. A 6 day-workshop where hackers, open source geeks and DIY (Do It Yourself) advocates come together with community activists to collaborate, co-create and co-produce through workshops, experiments, discussions and performance. Court Circuit Court: Social fabrics: on protocols, textile and salutations. Constant member Wendy Van Wynsberghe hosts an atelier on salutations and greeting rituals. Make textile sensors that initiate new ways of greeting each other with Arduino, sound and conductive thread. summerlab2012 —> from asso PiNG on Vimeo. This is a small ensemble of links, pictures and a lot more.. The nice thing about Ping! is their care for documentation – so basically my work here is very limited! Thanks everyone – it’s one of these events that resonate some months after! The urban sound world is quite dense. By extracting the ultrasound I wanted to reveal a sonic universe or even add another layer to the field recordings. When you hear only the ultrasonic layer of the city, you hear a place devoid of human voices. They simply do not reach that high. Some very quiet sounds get enhanced, such as rubbing your fingers together, frottements in French. In a parc at sunset you hear the foraging bats, whilst at the same time, our human ears only register ducks, planes and other humans. A swimming pool gets reduced to splashes, you do not hear the children shriek nor play. Plastic, metal, water all produce ultasounds. With the help of ACSR, I was able to record the same place in the city ultrasonically and with high quality “normal” microphones. This revealing/unravelling/hiding of layers of sound I want to present in this installation. The interaction happens on the moment you trigger the sound by touching the embroidery. The hand embroidered images visually represent the places in the city you are listening too. The embroidery was designed and mostly made by Dennis Marien. Here are some images of the embroidery. All areas delineated by fluorescent yellow are active zones, so are all punched with grey loopy conductive yarn. This started out as a solo project, I started from the sound and was thinking about how to represent the sound “spaces” in simplified embroidered images. By coincidence I met Dennis, a comic artist who realised a beautiful small graphic novel where all drawings were hand sewn. Dennis’s enthusiasm was contageous and I let him freewheel on the imagery. Go with the flow. We all embroidered (Dennis, his mum, my partner and me) – this is a very slow and labour intensive way of illustrating. The electronics and sound part ended up on my plate. Here is a video of the installation in it’s current form. You can play it with Firefox or another html5 compatible browser or with VLC. It’s a bit strange to make a video of an installation – we had to do it in one take, in half an hour, with no external microphone. This summer I will delve deeper into the audio part, in the studio running Ardour in ACSR. I will try to make a radiophonic narrative with this material. Thanks C & V & C! Domestic Science Club welcomes you Thursday 31/5/2012 at Recyclart/INVITRO. Wendy Van Wynsberghe will demonstrate some greeting protocols, re-enacted by the public. How can a group greet each other? Can we make new future greetings? By means of current, conductive textile, threads and sensors, cheeks will be dressed up, and make contact. David and Gosie will try to fly to the moon and back, with the help of a little black hole. with her boom box bike. A boom box bike is a bicycle ghettoblaster to play recorded music in public space. This one has an extra effect: speed of the music is set by the speed of biking. Sound documentaries and promotional melodies will linger in the Marolles air. Domestic Science Workshop is open during the event. We organize a miniature sandbag throwing lowland game. As many other human beings who once apon a time were present in the bolwerK realm, I received an invitation to come to Kasterlee, to the Frans Masereelcentrum. The object was clear: work with the bolwerK archive. The form, size, way in which to deal with this archive was open. As Masereel is the place to print (silk screen, letterpress and lots of other stuff I don’t even know the name of), I decided that the way of dealing with the archive should be through print, a topic I know nothing about. I do feel comfortable around electronics and physical computing. So I started thinking about a meeting point between these two with the *archive archive archive* mantra repeating in the back of my head. And I ordered a jar. Talking posters, playing soundfiles related to the bolwerK archive! Capacitive interactive posters, playing soundfiles related to the bolwerK archive! With the added sauce of stress concerning a misplaced laptop power supply (mine), I managed to get the painted prototype (not silkscreened) working, it gave me data, numbers in the serial port as you can see on the pictures. 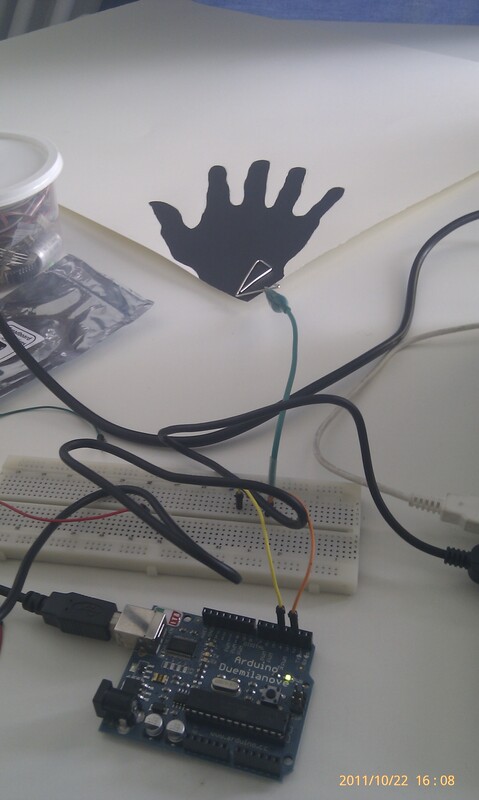 I was very lucky that Bare Conductive had just put up a manual on working with the paint entitled: “Building a Capacitive Proximity Sensor using Bare Paint”. Translated for non-techies this means that when you hover your hand over the conductive surface, something can happen. From this part of the text onwards, I will guide you to through some images. The hand has been cut out in a red foil, because everything which is red will become the positive image when you screenprint. A close-up of the conductive thread in the poster. I had to add conductive paint by hand with a paintbrush, in between printing the layers. Quite stressy and this requires clear instructions by the screenprinter and the “retouche” person. Asking two nice graphic designers advice on how you place an image in a poster (the cursor). Apparently, it’s all about ratio’s. It works! The code needs some tweeking by e-mail afterwards. – A sound work by an invited artist, made in Kasterlee. – And a Hello from Vorst, Brussels. As you can see, the posters are connected with a cable to an Arduino and a waveshield. The waveshield is connected to a speaker. Here is the final Arduino code. 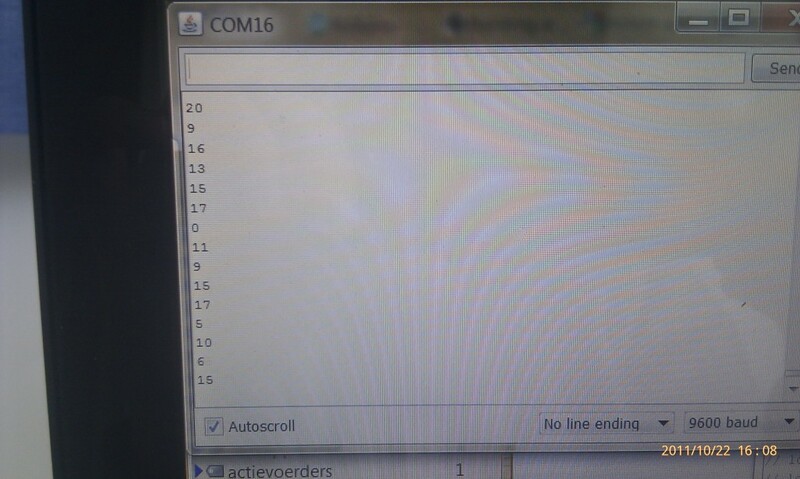 It is a Frankenscript of the code for capacitive sensors and the code for the djette (a bolwerK project). You need the waveshield library (AF_Wave) and the capacitive sensor library (CapSense). Wavefile wave; // only one! I was lucky to get caught in the gravity pull of bolwerK. All collaborations were wonderful, crazy, sharp, complex, heavy, light at the same time. So, I guess, thanks, bolwerK! is quite appropriate. Lieven – huge thanks for your patience with the stubborn conductive ink and putting up with the lack of time. I’m at the Masereelcentrum – in the framework of Interpunctie, organized by Bolwerk. These are some images of a set-up of an interactive talking poster. 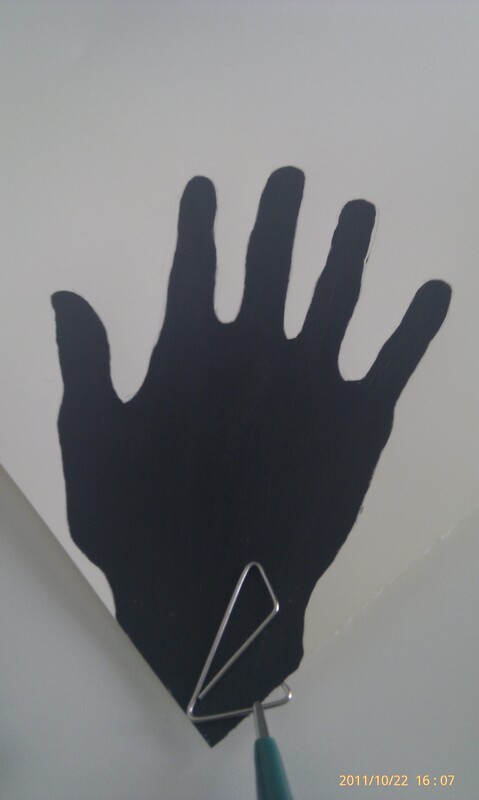 The black hand has been painted with conductive paint and functions well as a capacitive sensor. Last Friday the Constant Variable Floss Arts lab opened. The photographs are here. In connection to that, the Open Hardware studio has started activities as well! The idea is that you can use the modest facilities of the space to work on artistic Open Hardware projects. Open source hardware (OSHW) consists of physical artifacts of technology designed and offered in the same manner as free and open source software (FOSS). Open source hardware is part of the open source culture movement and applies a like concept to a variety of components. The term usually means that information about the hardware is easily discerned. Hardware design (i.e. mechanical drawings, schematics, bill of materials, PCB layout data, HDL source code and integrated circuit layout data) in addition to the software that drives the hardware are all released with the FOSS approach. In the case of the Open Hardware studio, all kinds of simple tinkering projects with knowledge which is “out there” also come into consideration, as long as you don’t claim to have invented them :-). The studio is not big, so we will really look at proposed projects, because we share the space and resources. Today for example we worked on all kinds of robots made with vibrating motors – the ones you find in mobile phones. We are giving a workshop next week for kids, where they will learn to make their own bots. Click on this link to see the drawbot in action! If you have a proposition of an activity in the Open Hardware Studio, or if you want to know more about it, send an e-mail to wendy attttt constantvzw.org. The month of May has been busy busy. Lots of challenging activities, lectures, workshops, inside, outside and even more than a million Volts somewhere along the line. For posterity’s sake, and to keep a trace of past adventures I’ll try to reconstruct these activities in some stories. The Digitale Werkplaats together with AKV|St. Joost is organizing a day around sound & noise. Constant was invited to participate with a lecture and a workshop. We decided to make a contribution on scanning the inaudible frequencies, combining this with the manual made by julien Ottavi aka Noiser, under a GNU Free Documentation License, as a starting point. We will make antennas that transform the electromagnetic spectrum into audio, listen to work of other artists, look at free licenses in art. To end the day we will walk in ’s Hertogenbosch with our DIY antennas. I’ll tackle these topics one at a time. Of course I start out the talk with who am I, what is Constant, why am I here etc.. Half a year ago the Audiovisuele werkplaats invited me to give a workshop on building an EMF antenna, because they had seen the Baltanprogramme. Now, I did not want to just give the workshop without contextualizing, and talking about the origin of the manual of the workshop. I start out by showing some work of artists who use EMF in their artistic work, such as Christina Kubisch and Joyce Hinterding (proprietary work). Both Hinterding and Kubisch’s work are result based – you as a spectator are not directly involved into the “how does this work?” aspect of their installations and sound walks. The technical part keeps it’s mystical layer, although Hinterding’s installations actually integrate the antenna visibly and physically in the space. Both artists – as most artists – do not integrate the reproduction/future life of their work into their practice. As we were going to build antenna’s during the afternoon which are based on the manual Julien Ottavi wrote in 2007 in the VJ 10 book Tracks in electr(on)ic fields, we delved a little bit deeper into the topic. A user guide or user’s guide, also commonly known as a manual, is a technical communication document intended to give assistance to people using a particular system. It is usually written by a technical writer, although user guides are written by programmers, product or project managers, or other technical staff, particularly in smaller companies. User guides are most commonly associated with electronic goods, computer hardware and software. Most user guides contain both a written guide and the associated images. In the case of computer applications, it is usual to include screenshots of how the program should look, and hardware manuals often include clear, simplified diagrams. The language used is matched to the intended audience, with jargon kept to a minimum or explained thoroughly. I started out with an image from Openclipart, with the keyword “manual”. 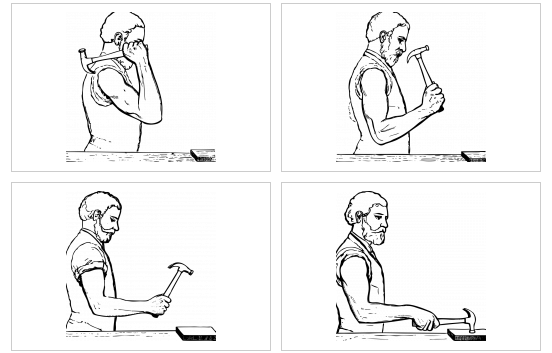 In four images the body positions of hammering are shown. For me, in the nature of a manual there are step-by-step descriptions on how to build or fix something, from code to hardware, from operating systems to making sensors detect. Were it not by the generosity of others I could not do what I do now, make the work I make. I depend on other people’s generosity to share their ways of working, step by step, meticulously documented on wiki’s, fora and tons of other websites. Last April I had a serious technical problem – for a week I dialogued with someone on a forum on this issue and he or she found and solved the problem. With the idea in mind that other people could run into the same problem I had, I tried to document everything step by step, as clear as possible. In Free software and open hardware circles, this kind of practice is quite standard – but in a visual arts context this is not so common. This is why I wanted to highlight this way of working. So I showed a part of this process in Den Bosch. Through these manuals I snuck the theme of licensing into my talk. In these online manuals, howto’s, quite often there is no particular license added to the content, which means that the content is automatically copyright, which in theory you cannot reproduce these manuals. I explained the Gnu Free Documention license, because the Antenna making manual has this license. * All previous authors of the work must be attributed. * All changes to the work must be logged. * All derivative works must be licensed under the same license. * The full text of the license, unmodified invariant sections as defined by the author if any, and any other added warranty disclaimers (such as a general disclaimer alerting readers that the document may not be accurate for example) and copyright notices from previous versions must be maintained. * Technical measures such as DRM may not be used to control or obstruct distribution or editing of the document. From Julien’s Ottavi’s manual onwards (you can download a translation into English here) we had a look at the trajectory of antenna making workshops, starting with the one during Verbindingen Jonctions 10. Here’s the video of that walk and the photo gallery. His antenna churned out visualisations and other adventures. From Gent to Eindhoven: a workshop in Baltan. Making antenna’s with Julien Ottavi and artist/participants. Even with the same ingredients, copper wire, making a coil, linking it to an amplifier – the antenna’s themselves turn out very differently. The report of Baltan on the workshop.Here’s the gallery of the whole workshop. After all these inspiring images of antenna’s, the Ada workshop participants started out to make their own version. I have no pictures of the workshop itself – as I was too busy following what everyone is doing. After the workshop we went out into ‘s Hertogenbosch to scan the city. Our mobile buzzing orchestra did attract quite some attention, but even walking through the Court (justice department) and the train station just gave us some curious glances – and a few questions – but nothing more. Here’s and audiovisual account – something I repeated in the evening part of the day. None of the recordings were edited. Next to the woodwork shop where we built the antenna’s, there is the parking lot. We started out by having a little feedback concert. When the antenna’s are close to the amplifier/speaker, they give out a loud a squeek of feedback. In my imagination it sounds like a group of loud sea lion males :-). Parallel to that we did some experiments with our own camera’s, listening to the zoom and flash. Everywhere in the Den Bosch train station there are yellow poles, with Rfid readers on them. Each time you get out of the train, you not only check yourself in, but also out. More data about the travellers. There seemingly quiet poles are actually EMF-wise quite loud. They send out a continuous electrical pulse in order to power the potential card passing by, enabling it to get the unique number on the card (the card needs a little bit of power to give out it’s number). This video is our walk in the station. One of the participants met a friend in the train station. We all demonstrated our circular instruments and started playing with the antenna’s and her mobile phone. Parking meters with their whirring ad whizzing small electrical engines create quite a nuanced spectre of EMF. So when we saw a man going towards the parking meters, we asked him if we could records the payment. The friendly mustached car driver happily complied. This same street was full of the 50 Hertz buzz, the sound of 220 Volt running under the pavement, cables everywhere, going to the houses, shops and further into ‘s Hertogenbosch. At the end of our walk, we truly became an improvisation orchestra, listening to each other’s buzzes and hums. Playing with distance, interacting and playing the EMF Rhythms produced by the city. Listen to the audio first, best with a headphone – to see afterwards what we were playing with. If you have trouble listening to the sound or watching the video’s: they can all be downloaded here and watched/listened to with VLC. I’m preparing a talk on licenses and art, for next Tuesday. In my research I stumbled on the importance of books in the life of 19th century author Herman Melville. This post is not about the books that influenced him as such, but about the annotations he made in them. With the posthumous dispersal of his library in the 1890s (when newspaper obituaries commented that he had long been assumed dead), Melville’s complex relationship to the book—as source of knowledge, as vehicle for literary expression, and as image of vanished prestige and lingering self-worth—reached fitting closure. Like larger blanks in the documentary record of his life that have resulted from decades of contemporary and posthumous neglect, the blank catalogue of Herman Melville’s library captures the poignant juxtaposition of aspiring intellect and contemporary failure so thoroughly bound up with his status among America’s greatest writers. Extraordinarily responsive to literary influence, Melville frequently marked and annotated what he read, and he relied heavily on sources in the composition of his own works. Pursuit of Melville’s dispersed library and identification of his reading and sources have extended across several generations of scholars and now approach 100 years of research. Title: The Natural History of the Sperm Whale: Its Anatomy and Physiology—Food—Spermaceti—Ambergris—Rise and Progress of the Fishery—Chase and Capture—”Cutting in” and “Trying Out”—Description of the Ships, Boats, Men, and Instruments Used in the Attack; with an Account of its Favourite Places of Resort. To which is added, a Sketch of a South-Sea Whaling Voyage. Publication: London: John Van Voorst, 1839. Association: Autographed, marked and annotated by Herman Melville. This book is available here. The Melvilles Marginalia website – on his annotations – is beautifully detailed – they scan the spine of the books and the pages are facsimiles. Melville normally recorded annotations in the top, bottom, and outside margins of the page, and usually linked them to text with corresponding x’s. In its transcriptions of annotations, the edition represents Melville’s words in large, bold, italicized, characters. Editorial policy is to observe the marginal locations of Melville’s inscriptions as well as the distributions of Melville’s words per written line. But whereas it positions annotations within the same marginal areas as the originals, the edition does not attempt to duplicate the exact spatial relationships between Melville’s individual words and the printed text areas. Although erased markings are with rare exceptions fully recovered, Melville’s erased annotations range among the fully deciphered, the partially deciphered, and the undeciphered. Partially deciphered erased annotations appear with editorial insertions enclosed by square brackets. Where words and letters can be responsibly conjectured on the basis of material evidence, these bracked conjectural readings appear in non-italicized characters. Undeciphered words appear bracketed as question marks preceded and followed by dashes.